As evidenced by the fact that discussing Breaking Bad now accounts for 50 percent of all human conversation—to the point where a baby born to the remote Mursi tribe yesterday drew its first breath and squealed, "I am the one who knocks!" before being immediately put to death—a lot more people watch Breaking Bad now. 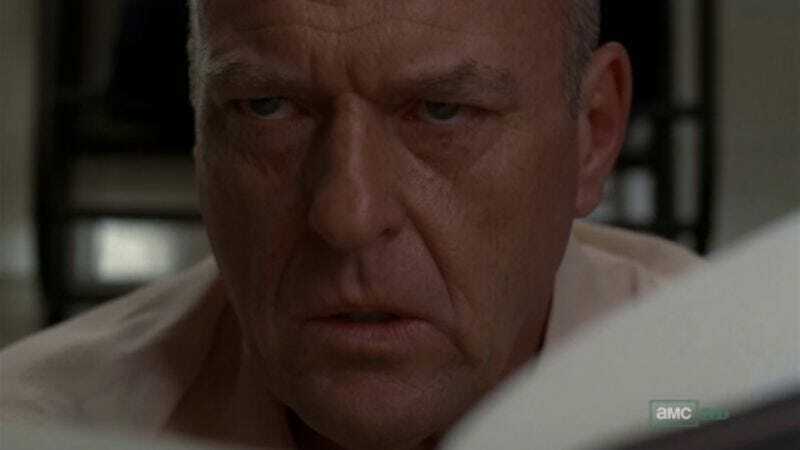 In fact, 47-percent more people watched Sunday's finale than last year's, with 2.8 million viewers tuning in to see Hank drop a very different kind of bomb in the episode's waning moments. As noted in an AMC press release, this first half of the show's swan song saw an overall 56-percent increase in viewers age 18-49, continuing a rare exponential growth from year to year that one might compare to some sort of addiction-related epidemic, were there only an apt comparison to make. At this rate, by the time Breaking Bad returns for its final eight episodes in summer 2013, so many people will be watching that Twitter and Facebook will essentially be nothing but Breaking Bad spoilers.